“In documentary, you are trying to record a moment. You are not just trying to get close enough to get a portrait, you are trying to get a sense of the time period and the place,” muses Steve Schapiro when addressing the differences between photographic forms. 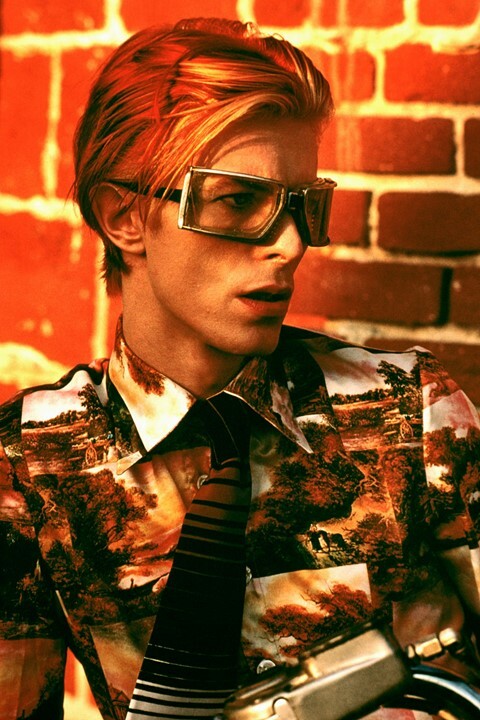 In short, he’s a photographer whose eye brought him into creative collaboration with Bowie, a friendship with Andy Warhol, on set as a photographer for Martin Scorsese’s Taxi Driver, and saw him write history when he was the first on the scene after Martin Luther King was assassinated. Whilst his photos of the Civil Rights Movement, such as the Selma to Montgomery march, came to define an era, Schapiro has also lived through some of the most significant changes in photography, making his insights even more valuable today. Below we catch up with the photographer as his book of mostly never-before-seen photographs of the late polymath and icon are published in Bowie By Steve Schapiro by PowerHouse books. Can you tell us a bit more about how your relationship with Bowie came about? Steve Schapiro: Well, I knew his manager so that is how it initially came about. One day, he asked me if I wanted to photograph Bowie and I said yes before finishing the sentence. 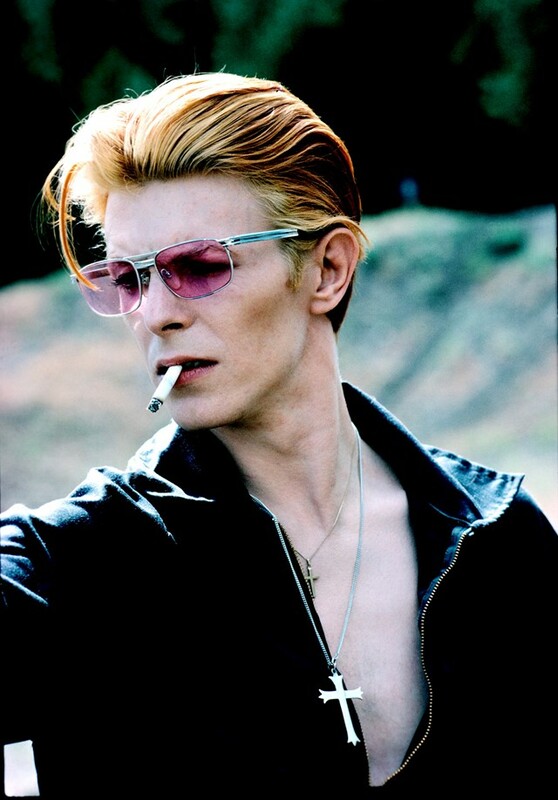 I have experienced photographing a lot of people, but, Bowie, he was different. He was calm, very intelligent, didn’t drag around 20 cases of beer with him… we talked about philosophy and he had a very definite idea of what he wanted to do… he was very specific, he kept changing and pushing things further and further. Your photos of Bowie are so striking. When you are shooting a celebrity, or someone who has a well-known stage presence, how do you make sure that you are also keeping control of the image and making something unique? Steve Schapiro: If you get to work with someone like Bowie, or someone just are talented, it really is a subconscious or conscious collaboration. You both know you are really trying to get iconic images: images that are strong and get to the spirit of the event. I have worked with a lot people, such as actors, who have an incredible ability to develop a character and be another person and play their part. But, there are a lot of characters who do not know who they are themselves and they don’t know who they should be. David has a very great sense of who he is because he knows who he is and works from that… he doesn’t have to question any of that. He had a real sense of his personality and what he wanted in combination with his great sense of confidence. The best images of Bowie were some that I only recently got back from Bowie's office because I didn’t have the transparencies. When we shot together last October, he borrowed a dark shirt from my assistant and came out with it back on. Then, he started drawing circles on the background paper and drew a diagram from the tree of life. 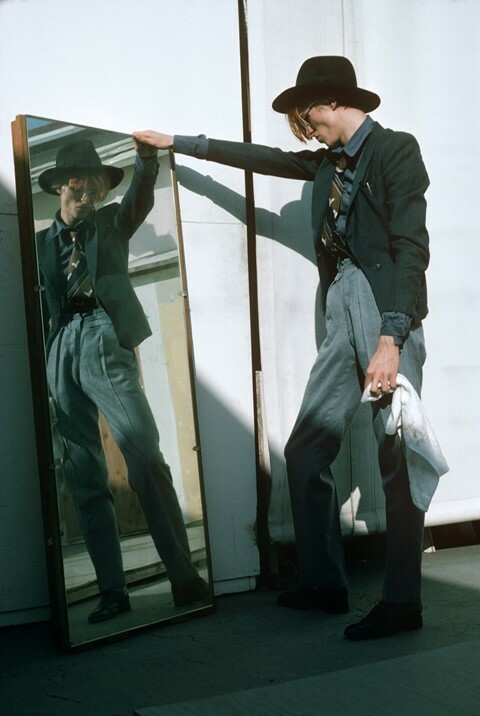 At the time, it was clear he was in spiritual mood but, now, to find that it was also in his final video, wearing a similar outfit which he had never worn before… it is just another example of how Bowie continually transformed himself and changed his directions. It shows that his ideas were always his and I just helped to bring them into the light of day. It has been widely reported that you fell in love with photography at the age of nine. Can you tell us about the first moment you picked up a camera? Steve Schapiro: I was at camp and I had a baby brownie camera and we used to develop the film ourselves. I remember being transfixed by the clouds in Vermont and seeing them emerge out from the solution... I was really obsessed with how photography technically worked. As an adolescent, I became interested in people. I remember very vividly being really impressed how Henri Cartier-Bresson captured a moment. There were three elements that made up a good photo; emotion, design and information. His photos always did that, they reflected his now famous ‘decisive moment’. For those that don’t know, that moment is the one at the peak of a situation. You learn to capture that through experience and I used to go out take pictures in the hope that it would become natural for me to get it. I used to go out in New York and my timing would always be a few seconds off because I had missed the moment but I think, sometimes, I get it now! When you first realised that Martin Luther King was shot, how did you feel? Did you feel under extra pressure to photograph such an important moment? Steve Schapiro: I had done a lot of civil rights for LIFE and other magazines. In was in New York when it happened, they told me to go immediately to Memphis. I went into the grooming house where the shots had been fired from and the assassin had stood in the second-floor bathtub. One dirty black handprint remained from the attacker and I knew that I had to photograph that image. Then, I was let into his hotel room by one of his aides… on the TV set, there was an image of Doctor King and so I photographed that as a whole picture. The physical man had gone forever but just his possessions remained which felt really emotional and powerful to me. The next time I went to Memphis, they had taken the possessions out of the hotel room and moved them to a museum. It was strange because the things that had been so emotional to me had just gone even though they are in a national museum now that change really effected me. Funnily enough, it isn’t always just forming an image that works which is how I feel about my new Bowie book. The book is different because it isn’t just a rock and roll book. It isn’t him performing on tour, it is more about seeing him as a real person between all the costumes and to get a sense of him instead. Steve Schapiro: When I start shooting, I am more nervous than the people I start shooting! I always try to be on the same wavelength. When I worked for LIFE magazine, four days or six months and during that time you were almost like best friends, you were so close. That is the hard thing now in this new age because you work with public relations people a lot more and they are hanging around mediating your relationships. With LIFE, when I worked with a reporter, you would be very quiet like a fly. But, now, media journalism has changed and although you basically do the same kind of story you don’t get to spend so much time with them and you just ask them to change their clothes to replicate the passage of time instead. Has there been a photo that you wish you hadn’t taken? Steve Schapiro: I have never done anything which has been detrimental to anyone… I haven't photographed anyone that I shouldn’t have and I don’t know that I have done. I have always tried to move forward in my work and do things that are positive and things that have a positive effect on what people saw in them. What are the biggest changes and developments you have seen since you first started taking photographs? Steve Schapiro: We have gone from film to digital camera and that is a big change. With digital, people don’t shoot black and white so much. In my opinion, black and white is much more emotional. You are conveying an emotional experience that you do not want your viewers to be distracted from. When you shoot colour, your eye will be draw to the dynamism of that rather than the emotional situation which you really care about. Of course, this works both ways, though. Sure, there are advantages with digital because if you take a picture, for example of a couple and they have their eyes shut, you don’t have to wait; you can reshoot immediately! It is natural that the way we communicate shifts over time but I do think the camera is becoming obsolete and people are much more interested in smartphones. Consequently, photos do not stand out in the same way anymore. When I grew up, there were certain images that would stick... and this is not true anymore. So many photos are taken, they just get thrown around and they don’t stay with you. For example, I saw a really iconic image of Obama – it was amazing. I will probably never see it again, the image will never surface again. What tips do you have for aspiring photographers today? Steve Schapiro: Realise everyone is unique. We don’t all work in the same way. So, instead, it is a question of developing your individuality and then finding a way of transferring that into photography. That’ll help you find your own point of view. Remember, the camera is not the boss you are. You need to find a way that helps you can something more about your subject’s spirit.